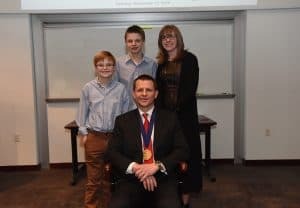 Alan J. Tackett, Ph.D., (seated) was named inaugural recipient of the Scharlau Family Endowed Chair in Cancer Research. With him are (from left) UAMS Chancellor Dan Rahn, M.D. ; College of Medicine Dean Pope Moseley, M.D. ; Charles Scharlau, J.D. ; and Kent Westbrook, M.D. Dec. 14, 2016 | LITTLE ROCK — Alan J. Tackett, Ph.D., was invested Dec. 13 as the inaugural recipient of the Scharlau Family Endowed Chair in Cancer Research at the University of Arkansas for Medical Sciences (UAMS). He is a professor of biochemistry and molecular biology with secondary faculty appointments in pathology and pediatrics, all in the UAMS College of Medicine. Alan J. Tackett, Ph.D., (center) is joined by members of his UAMS laboratory. The endowed chair was established by a gift from Charles E. Scharlau III, J.D., retired chairman and CEO of Southwestern Energy Company. It will be used to further Tackett’s research efforts aimed at discovering new approaches to detect and treat metastatic melanoma, the most dangerous form of skin cancer. “Through Mr. Scharlau’s generosity, we are ensured that the highest level of cancer research will be continued here at UAMS for years to come. His foresight and dedication to Arkansas’ scientific community is greatly appreciated and will make it possible for our scientists, such as Dr. Tackett, to advance their life-saving research unlocking the pathways to new and innovative therapies,” said UAMS Chancellor Dan Rahn, M.D. Tackett’s research involves using advanced technology to discover molecular pathways essential for the development of new therapies and finding new biological markers to assist in developing personalized treatment for each patient’s specific needs. Alan J. Tackett, Ph.D., with his wife, Rebecca, and sons. Tackett’s research has been continuously funded by the National Institutes of Health (NIH) throughout his career, and his research endeavors have resulted in more than 80 peer-reviewed manuscripts. He has written multiple book chapters, been awarded four U.S. patents, acted as a scientific journal editor-in-chief, and served on more than 35 NIH extramural-funding review panels. Tackett oversees three biomedical research laboratories on the UAMS campus and one at the Arkansas Children’s Research Institute. “Dr. Tackett’s expertise as an academic research scientist is evident not only through his work in the lab, which I have witnessed since he came to work with me 1998, but also by the influence he has on countless students and colleagues. He has served in more than 50 NIH-associated laboratories and as co-investigator for more than 20 NIH grants. We at UAMS are honored to work with Dr. Tackett and benefit from his knowledge first hand,” said Kevin D. Raney, Ph.D., professor and chair of the Department of Biochemistry and Molecular Biology in the UAMS College of Medicine. Tackett serves as director of the National Institutes of Health (NIH) Institutional Development Award (IDeA) National Resource for Proteomics, director of the NIH Arkansas INBRE Research Technology Core, director of the UAMS Graduate School Biochemistry and Molecular Biology program and track, director of the Arkansas Children’s Research Institute’s Developmental Proteomics Laboratory, and co-director of the UAMS Proteomics Facility. In 2011, Scharlau and his late wife, Clydene, endowed the Charles and Clydene Scharlau Chair for Hematological Malignancies Research, which is held by Frits van Rhee, M.D., Ph.D., professor of medicine in the UAMS College of Medicine and director of developmental and translational medicine at the UAMS Myeloma Institute. 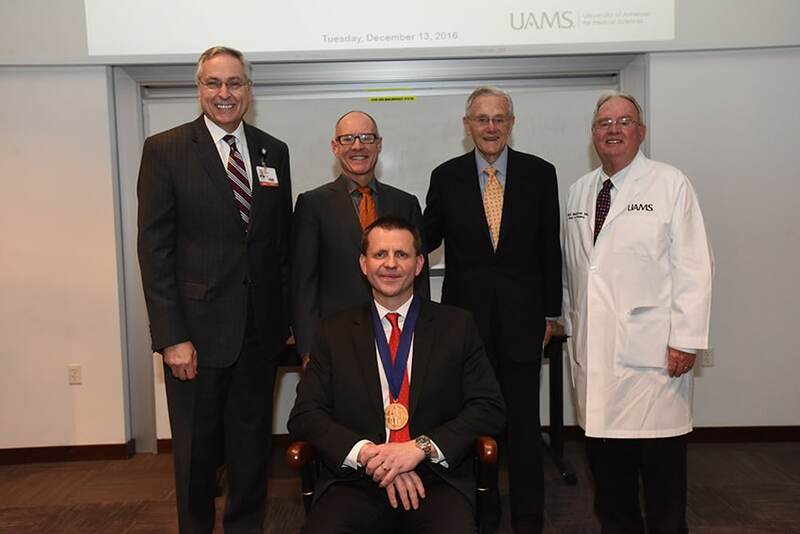 Following his wife’s death, Scharlau established the Scharlau Family Endowed Chair in Cancer Research at UAMS in honor of Kent C. Westbrook, M.D., distinguished professor in the UAMS College of Medicine, and Bart Barlogie, M.D., Ph.D., founder of the UAMS Myeloma Institute. “To find someone truly dedicated to the importance of cancer research, you need look no further than Charles Scharlau. 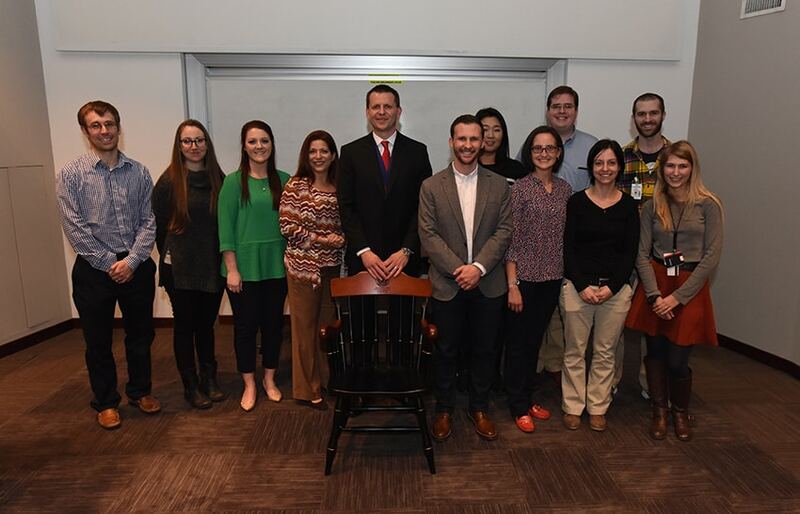 By establishing two endowed chairs for cancer research at UAMS, Mr. Scharlau has made a long-lasting impact not only on our institution, but also on countless patients who will benefit from the discoveries these chairs enable,” Westbrook said. Scharlau also funded the Endowed Chair in Presidential Leadership to support the University of Arkansas System. Scharlau has been associated with Southwestern Energy and its affiliates since 1951 when he joined the company as an attorney, and subsequently held various executive positions. He has been the director of several business corporations, including Arvest Bank, Fayetteville; First Arkansas Bankstock Corp., Little Rock; and C.H. Heist Corp., Florida. A graduate of the University of Arkansas, Fayetteville, Scharlau served on its board of trustees from 1997 to 2007, and as chairman of the board for the 2005-06 academic year. He is a member of the University of Arkansas Foundation board of directors and serves as chair of the audit committee and a member of the executive committee.